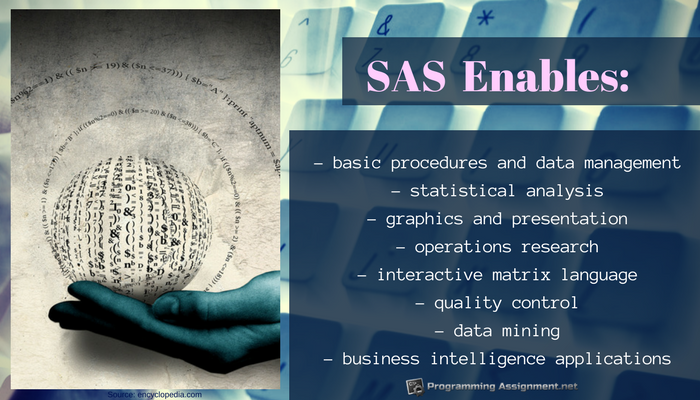 What is the Purpose of SAS Programming? SAS is one of the main analytic platforms for academic research and data analysis used by companies, institutions and organizations around the world. Academic assignment help – Our programmers can provide SAS assignment help with any aspect of SAS programming. The professional help we provide can help ensure an error-free SAS homework assignment, submitted on time, that meets assignment requirements. Programming project help – SAS programming projects will not be as intimidating with our expert SAS programmers providing their assistance. No programming project is too big or too small for our dedicated team of professional programmers. Personal tutoring – Students needing programming help that is more detailed may request our personal tutoring service. SAS programming help provided by our personal tutoring service is customized to individual student requirements. Programming level and programming experience are taken into consideration when designing the personal tutoring program. We are committed to providing the best possible customer experience, and to this end, we are scheduling personal tutoring classes that can accommodate whatever free hours you are able to commit. Our goal is to make using our service as customer friendly as possible. When you want programming help at affordable rates without sacrificing quality, contact us and take advantage of our professional programmer’s expertise!